It’s hard to understate the hype for Avengers: Infinity War. The entire Marvel Cinematic Universe has been building to this moment since 2012 (and really since 2008). Appropriately, this hype is manifesting in a desire to binge read loads and loads of comics, and I’ve got you covered with related recommendations. Below you’ll find 10 recommended reads that either inspire or connect to the characters and themes in Avengers: Infinity War. The first major storyline starring Jim Starlin’s cosmic powerhouse villain quickly escalates from the pages of Captain Marvel into Avengers #125. Setting the precedent that Thanos plays for much greater stakes than your average villain, the mad Titan gets his hands on a cosmic cube and quite literally ascends to godhood. It’s the formative Thanos collection, and his 70’s comics appearances amazingly represent all of Thanos’ representation until 1989! The most famous Thanos story, one of the biggest events in Marvel history, and the prime inspiration for the Marvel Cinematic Universe throughline. The story become increasingly convoluted and for die-hards only as the trilogy progresses, but fortunately Infinity Gauntlet is still extremely new-reader friendly. Oddly for newcomers, this is where you’ll find the actual Infinity War event, as the second part of the trilogy (concluded in Infinity Crusade). It is very different from the set-up and plot of Avengers: Infinity War despite the shared naming. 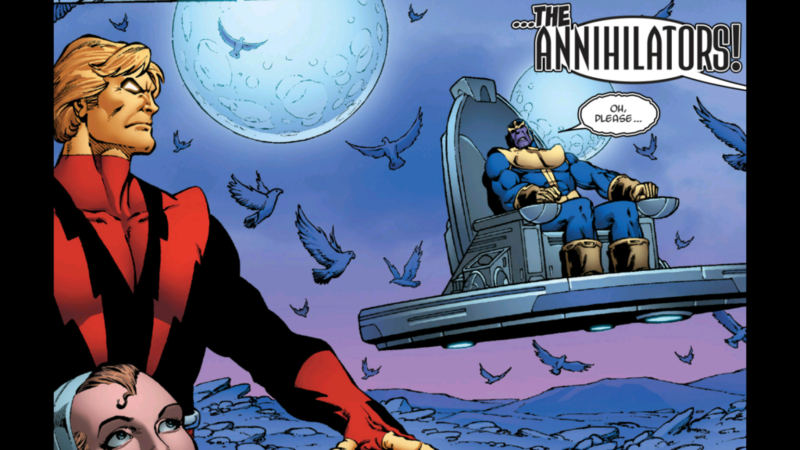 Jim Starlin returned to Thanos in the early 2000’s for the villain’s first solo series. It’s not quite Thanos breaks good, but it’s close! He fights Galactus! Both the start of the best modern Marvel Cosmic run of the 2000’s, and a formative story for Thanos and what will become the new Guardians of the Galaxy. You could quite reasonably also begin the modern Marvel cosmic era here. The comics that defined the Guardians as MCU fans know them today, with a story that builds to an inevitable confrontation involving Thanos! Jonathan Hickman crafted his own intertwining corner of Marvel Comics from 2008 to 2016, building up to the 2015 Secret Wars event. It’s all well worth reading, with the Avengers and 2013 Infinity event particularly relevant for the influence on Infinity War. During Infinity, Hickman and artist Jim Cheung created Thanos’ Black Order, his murderous lieutenants like Corvus Glaive and Proxima Midnight. Similarly, Hickman is the only comic book creative able to write a story sharing Jim Starlin’s “Infinity” oeuvre without desecrating the legacy! Starting in 2014 Thanos creator Jim Starlin began work on two separate “Infinity” trilogies. Although the second has been mired in very public editorial battles between Starlin and Marvel, the first new trilogy is complete and well worth a read. Despite the strange relaunch with a new #1 issue for Marvel Legacy (a Marvel refresh entirely predicated on connections to past iterations of comic book’s old series numbering), Thanos has been in good hands throughout the refresh. The Lemire and Deadato run pulls Thanos out of Secret Wars in a very compelling series, prior to Donny Cates and team setting the world on fire with the future-flung “alt” reality in which Thanos has won. While I quite enjoy the Illuminati miniseries in its entirety, the supergroup’s attempts to corral and control the Infinity Gauntlet is especially relevant.